Things happen to author's books that sometimes are stranger than fiction. Let me share with you my latest surprise. The Kindle edition of my book, Behind These Mountains, Vol. 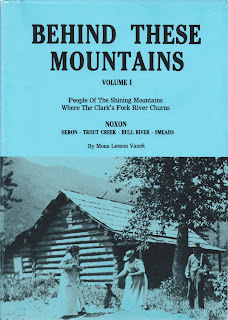 I: People of the Shining Mountains Where The Clark's Fork River Churns, went on sale April 17, 2013 at Amazon.com. Within a week, things began happening to copies of my out-of-print regional history book: The price of the few used print copies listed at Amazon escalated dramatically. From $50 (used) to the highest I saw for a second hand copy of that history book about western Sanders County, Montana: An astounding, "$1,894.95 plus $3.99 shipping from London, UK." The seller, Livrenoir, has a seller rating of 98% positive during the past 12 months, with 34,720 total ratings. Nevertheless, by early Sunday afternoon, April 28, not a listing remained. By evening, a few used copies were advertised ~~ if you located the right Amazon webpage. Although authors receive nothing from second hand book sales, as you know, I've checked for my books at Amazon periodically during the past few years, just to get an ego buzz by seeing used copies for sale at double and more the original price. What tweaked my curiosity about the Livrenoir listing was the fact that when the 1,500 soft cover books were published in November 1986 by Statesman-Examiner, Colville, Washington, Dorien Hampton Wolfe, Arthur and Fanny Hampton's daughter, who lived at Plains, Montana, bought a copy and took it to England to give to the family's English relatives. Edward and Mary Hampton settled at Noxon in the late 1800s before Montana gained statehood. Their niece, Dorien, and Bonnie Hampton Sharp, a grandniece who settled in Thompson Falls, Montana, where she was a teacher, have always also been movers and shakers in their respective communities. The copy Dorien Wolfe took to England is the only soft cover copy I'm aware of that went to the UK, although I sold and shipped copies of the original out-of-print edition throughout Sanders County, and elsewhere across the United States, Canada, and Australia. So naturally, I wonder it that could be the book listed on Amazon for the highest price? I learned of the book reseller only after Amazon released the Kindle edition of Behind These Mountains, Vol. I: People of the Shining Mountains Where The Clark's Fork River Churns", which sells for $19.95 and is far, far superior in every way to the original paperback edition. Fellow members of Internet Writing Workshop were invaluable in helping me edit and revise all 80 chapters in the trilogy, and by using PhotoShop ProX2TM and Picasa3TM the photographs are now excellent. Kindle editions of Behind These Mountains, Volumes II and III are scheduled for publication later this year. It's safe to say that availability of original soft cover copies of the Behind These Mountains trilogy swings like a pendulum. Anyone who owns a first edition may be interested to know that prices on Amazon for used copies keep rising, and the last Volume III I saw ~~ listed in excess of $500 ~~ was gone within days, as was a copy of Volume I listed for $435.62. Former Noxon, Montana, resident, Katherine Kay, whose business includes selling used books on Amazon, said people do pay that amount and more for certain rare out-of-print books. In this case, an autographed volume, with the original marketing brochure and bookmark that were included, increases the value considerably. However, after checking into Livrenoir, Ms. Kay was unable to ascertain that the book actually sold for the listed price. My advice? Keep your rare-out-of-print collectible copies, but enjoy a digital edition. As soon as arrangements are complete, in addition to the Kindle edition on Amazon, Behind These Mountains, Vol. I: People of the Shining Mountains Where The Clark's Fork River Churns will be available at Apple iBookstore, and at as many other ebook outlets, such as Barnes and Noble, Sony, etc., as possible. At some time in the future, Print On Demand (POD) versions may become available if some organization or publisher becomes interested.